We continue our election anniversary series by posing the question: What have the Democrats learned in the past year? It is tempting to answer in one word: Nothing. The Democrats lost the presidency last year, and before that they had lost control of Congress, and before that they had lost control of most state legislatures and governor's mansions. You would think it would have dawned on them that they are out of sync with the American electorate, but no. The party remains a congeries of special and particular interests with no compelling political and moral narrative. Hillary Clinton lost for a variety of reasons last year and many of her partisans pick the kinds of problems that plague most campaigns: bad external news, like the Comey letter reopening the investigation into her emails, or the lackluster economic recovery, or bad decisions by her staff, like ignoring Wisconsin in the general election. The problem, the real problem, is that to an electorate clamoring for change and distrustful of elites, we put forward a candidate who had been prominent on the national public stage since 1992 and who embodied the elites, right down to her conviction that the rules governing email use by public officials did not apply to her. Of course, there was no real scandal in the email controversy, but everything about Clinton's response to the controversy exemplified the dodging, evasive irresponsibleness that voters associate with elites. May her epitaph be that she failed to defeat a narcissistic, misogynistic blowhard for the White House. The Democrats needed one thing from Clinton after her electoral defeat. They needed her to disappear. Instead, she had to write a book, a self-serving memoir (is there any other kind a politician is capable of?) that was backward-looking at a time when the Democrats needed to be forward-looking. Thanks, Hillary. In the absence of a Democrat in the White House, the obvious national spokespersons for the party are its congressional leaders. And what do we find there? Minority Leader Nancy Pelosi was elected to Congress in 1987. She has been leader of the Democrats in the House since 2002. She is not what you would call a fresh face. Her No. 2 is Congressman Steny Hoyer, who has been in Congress even longer, since 1981. Pelosi represents San Francisco and Hoyer represents the suburbs of Washington, D.C., not exactly Middle America. In the Senate, the Democrats are led by Sen. Chuck Schumer, who has also been in Congress since 1981 and lives in New York City, another locale that does not exactly scream anti-establishment. Despite my problems with all three on certain issues, they have served the country and the party reasonably well, and I was proud of Pelosi when she stood up to the groups demanding that being pro-choice on abortion should become a litmus test for Democratic Party candidates. Nonetheless, Pelosi especially has been the target of negative ads for more than a decade. That negativity ads up. Ask Hillary Clinton. It doesn't matter whether the attacks are fair or not. They add up. If Pelosi wants to help the party, she needs to step aside, and bring the other members of the old guard with her. Let's see some new faces. Earlier this year, I called attention to an article in Foreign Policy that made the point that Emmanuel Macron's policies were not hugely different from those of his unpopular predecessor François Hollande. But Macron was a new face and he won both the multi-candidate first election and the runoff. There is a lesson in that. It is time for some new messengers. One of those new messengers is emphatically not Tom Steyer, who has launched a petition drive calling on Congress to impeach the president. In confronting a billionaire egomaniac willing to spend enough money to buy his own platform and get himself elected president, the Democrats need to do better than another billionaire egomaniac willing to spend enough money to buy his own platform. It is also time for a new message. Obviously, resisting Donald Trump is the first thing they must do, and do it well and strongly. But, too often, as one friend put it, their principal complaint against the president is that "he offends my culture-war sensibility." The Democrats, unwilling to stand up to their own special interests, especially when there is a lot of campaign cash involved, appear to be the party of Bob Mueller, abortion and transgender bathrooms. It is not a winning recipe. In the case of the Russia investigations, it was important that Democrats make noise and force an independent counsel. The second someone with the integrity, expertise and nonpartisan stature of Mueller was appointed as special counsel, they needed to get quiet, let him do his work. Every time Pelosi sends Congressman Eric Swalwell out to talk to CNN and MSNBC about the Russia probes, I cringe. First of all, Swalwell seems out of his league but, more importantly, his frequent media appearances — and those of others — lend credibility to the GOP talking point that this Russia business is all a Democratic Party witch hunt, which it obviously is not. Let Mueller do the talking and the work. The idea that Democrats need to start erecting litmus tests of any kind is ridiculous, but especially a litmus test about abortion rights. According to a recent study by the Pew Research Center, the category it labels "Devout and Diverse" is the group of Democrats most estranged from today's Democratic Party. And is it any wonder? If the Democrats place the phrase religious liberty in scare quotes, label anyone who holds traditional views about marriage a bigot — views President Barack Obama claimed to hold until it became politically convenient not to do so — and make a commitment to late-term abortion a litmus test, why should religious people vote for them? And while Democrats carp about transgender rights, but go along with trade deals that adversely affect millions of people, is it any wonder that those millions will seek political solace elsewhere? In addition to resisting Trump, the Democrats must craft an alternative appeal, and the heart of that appeal must perform the difficult balancing act of criticizing the way things are and pointing to a better future. Fortunately, there is a word at hand: opportunity. Find me a Democratic governor of a rural state who has taken steps to provide fast internet access to rural areas, and you will have found me a candidate with some promise for 2020. Find me a candidate who has helped get sustainable energy jobs in his or her state, and made sure they are union jobs, and you will have found me a candidate for 2020. Find me someone who is willing to reframe the debate about trade away from the zero-sum terms the president employs and, instead, recognizes that what has passed for free trade in the past several decades is not free at all, but gives all the power to multinational corporations and no power to workers here or abroad. Find me a candidate who talks as much about vocational education as about paying for college, maybe even a governor or mayor who implanted a successful vocational program. Find me a candidate who is willing to distance him- or herself from a prominent special interest, to have a "Sister Souljah moment," and you will have found a candidate capable of winning a national election, even if only to say that a particular culture-war issue is simply not as important as creating good paying jobs for those left behind. Nothing in the last year should have convinced any Democrat that the traditional playbook will work. It is time for a new message and new messengers. Forget about the particulars. The leaders of the Democratic Party have not even learned this lesson. 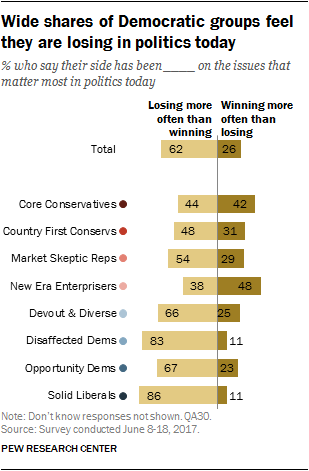 Inside-the-Beltway views still dominate. Pollsters still warn against controversy. No one is willing to stand up to the special interests that distort the party's message. Unless the Democrats get their act together, there is no reason to think that Trump, with a strong economy at his back, will not be the odds-on favorite for re-election. You would think that grim prospect alone would be enough to galvanize Democrats toward change. And you would be wrong. Column | What have the Democrats learned since Trump's election?